Sinpopo Brand, which started with simple nostalgic food, has a new menu and new décor to match. Much more than a coffee shop now, our menu boasts our personal renditions of your familiar local dishes. Enjoy a casual weekend snacking on our unique luncheon crisps and crispy crab wontons, or have a dinner date over our beautiful mains of house special Nasi Lemak and bone-in pork chop with curry sauce. Don’t forget to top it all off with your favourite Durian Pengat with Coconut Ice Cream and Gula Melaka Soft Jelly (now served with handmade gula drops and coconut cream)! Sinpopo Brand was started as an ode to Katong and its heritage. In the late 60’s, Katong was well-known for its unique peranakan culture and cuisine. Today, Katong is completely different. With a plethora of Western food and the heritage businesses being crowded out. We felt the need to put the Katong back in Katong and to have something with distinct local touches. 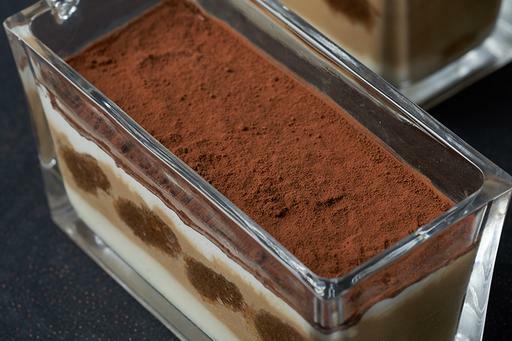 A Singapore take on a good ol' tiramisu. Made using local coffee grounds, layered with a lovely light condensed milk cream and custard mascarpone with coffee finger biscuit.